Just a few years ago, if anyone wanted to learn how to use animation in web and UI design, they needed to enroll in computer science or design courses in a school or university. But now, anyone can register online for a course at their own leisure without having to go to school for it. Learning user interface design is now easier thanks to free and premium tutorials available online. In this article, we have compiled a list of those UI/UX design tutorials that will help you jumpstart your web and UI design career. 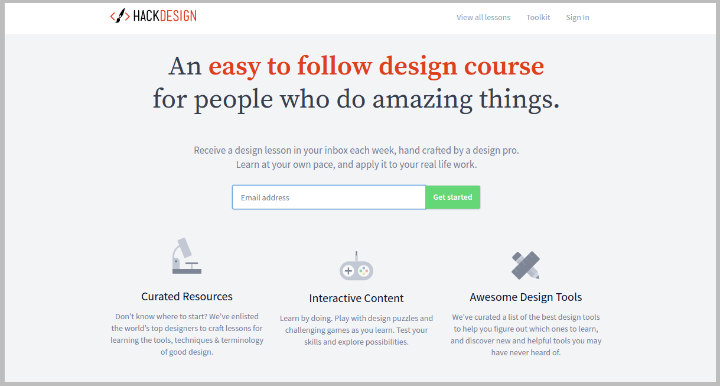 HackDesign is a free online resource for learning the ins and outs of user interface design. The site is curated by more than 30 designers who specialize in various fields. Upon registering for the tutorial, you will receive weekly digests of web design lessons and hacks. Each lesson is carefully curated by a design professional and any learner can apply each lesson at his or her own pace. The HackDesign course syllabi include lessons on typography, user experience, user interface, graphic design principles, mobile design, interaction design, front-end design, product design, advanced user interface and user experience, and much more. If you want to take your UI design lessons seriously, investing in a paid UI design tutorial like the LearnUI.design course may be the one for you. This tutorial was created by Erik Kennedy and is only available during certain periods of the year. Most feedback from learners of this tutorial refers to the extensiveness of the lessons. As part of the course, students can access an 18-hour video series and a separate channel where you can discuss the lessons and/or ask questions or feedback. One-on-one coaching lessons are also available where students can get six hours of personal coaching through Skype. This type of coaching may be for you if you want to learn UI design quickly. In this tutorial, you will learn about the fundamentals of UI design, color theory, typography, user interface components, animation techniques, and application of this theoretical knowledge into real-world processes. The creator of this tutorial emphasizes that this course is for those who want to efficiently learn UI/UX design without having to go to school for it. 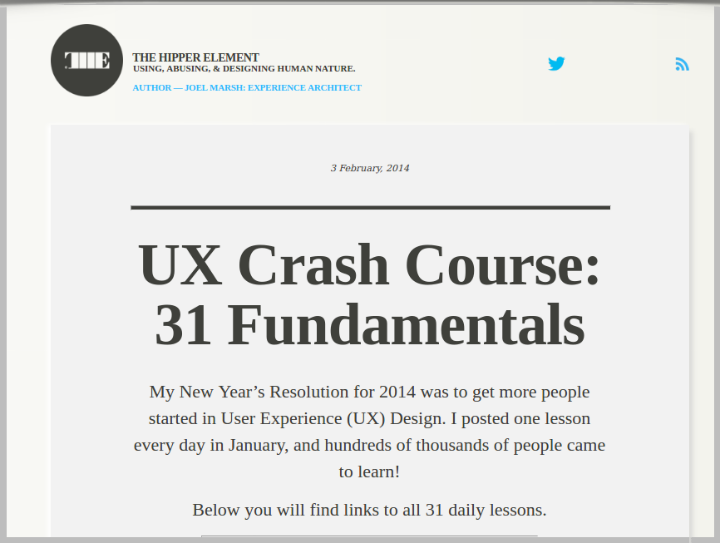 The UX Crash Course tutorial is another free tutorial from Joel Marsh. It is posted on The Hipper Element.com’s Tumblr account. These training lessons began as part of the author’s 2014 New Year’s Resolution to let a lot more people learn about user interface and user experience design. After posting that first tutorial, the post gained traction throughout Tumblr and the Internet. The UX Crash Course includes lessons on user understanding, information architecture, visual design principles, functional layout design, data design, user psychology, and a lot more. 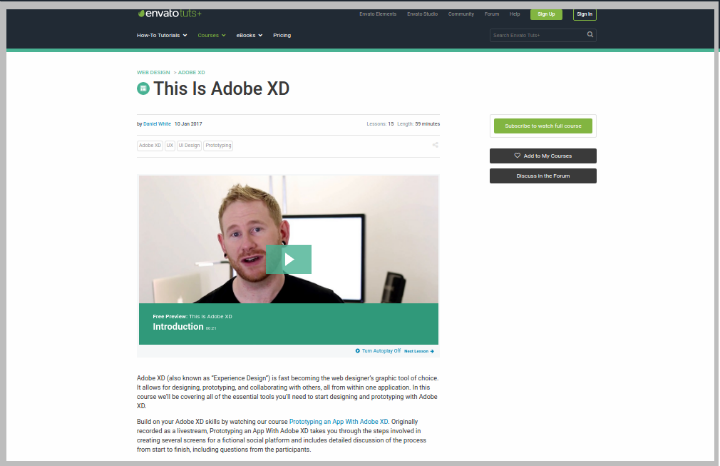 The This is Adobe XD tutorial is a paid course available on Envato Tuts+. As the course’s title indicates, this tutorial focuses on how to use the Adobe XD (Experience Design) software program. This software was developed as an all-in-one tool for creating beautiful user interfaces. This tutorial includes 15 step-by-step video lessons. It is hosted by Daniel White. 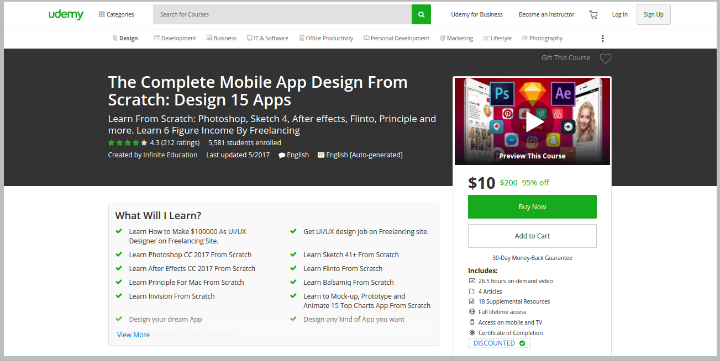 Another premium UI design tutorial on Udemy.com is The Complete Mobile App Design From Scratch: Design 15 Apps. 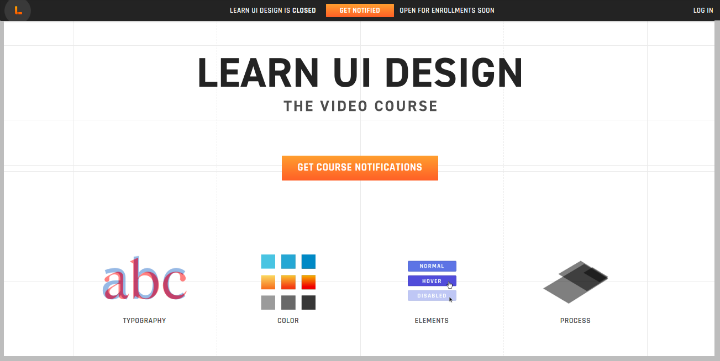 This tutorial includes lessons on both UI and UX design. It consists of 26.5 hours of video lessons, four in-depth articles on UI design, and lifetime access to the lessons on both mobile and TV. 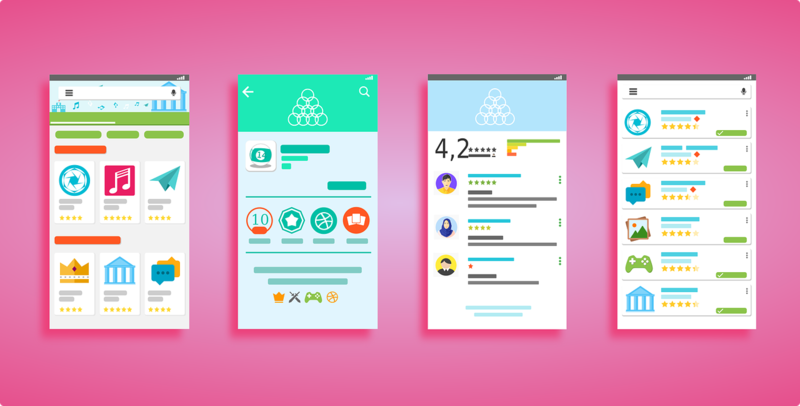 You will also learn how to make mobile apps using Photoshop and Sketch; how to animate UI using After Effects; how to prototype mobile apps using Flinto, Mac, and Invision; and learn how to wireframe using Balsamiq. After completing this tutorial, you will also earn a Certificate of Completion. The internet is filled with a lot more tutorials aside from the ones mentioned on this list. So if you are still interested in learning more about UI design, feel free to supplement your learning by studying other materials that will allow you to learn other useful tips for better UI design.